John Coltrane’s transformation of Rodgers and Hammerstein’s “My Favorite Things” is the first example of irony. Embedded within Coltrane’s well-known version of “My Favorite Things” are several significant musical and cultural issues. First, there is an ironic juxtaposition of Coltrane’s version and the simpler and more sentimental version sung by Mary Martin in the stage production of The Sound of Music. Coltrane in this respect demonstrates the power of his musical intelligence and imagination (and that of his band members) to transform a European-American musical theater song into a vehicle for expressing the improvisational aesthetic of jazz. Second, Coltrane evidently liked something (perhaps the meter) about the tune, which led him to choose it for basic material. An appreciation of the potential of music drawn from European-American musical theater, in other words, does not contradict the articulation of an African-American improvisational aesthetic. Third, Coltrane may have wanted to reach a broader audience in a time-honored manner, that is, by selecting a musical theater tune. Fourth, Coltrane’s version asserts the power of the African-American musical aesthetic to “improve” the music of European-Americans. This last point is most important for our discussion: in terms of the aesthetic of African-American jazz, the Coltrane version is without a doubt a vast “improvement” upon the original. Jazz listeners generally view the transformations of Broadway tunes as considerably “superior” to the original material. In critical evaluations made by jazz listeners, an African-American musical aesthetic is the taken-for-granted standard against which the Broadway version is judged. I have placed evaluative terms in quotation marks to emphasize my awareness that the African-American versions are not inherently “better” but relative to a particular aesthetic (which many non-African-Americans share as well). Most notably, these tunes are made to swing by the addition of jazz grooves that are not present in the original and of more complex harmonies than exist in the sheet music versions of these tunes. 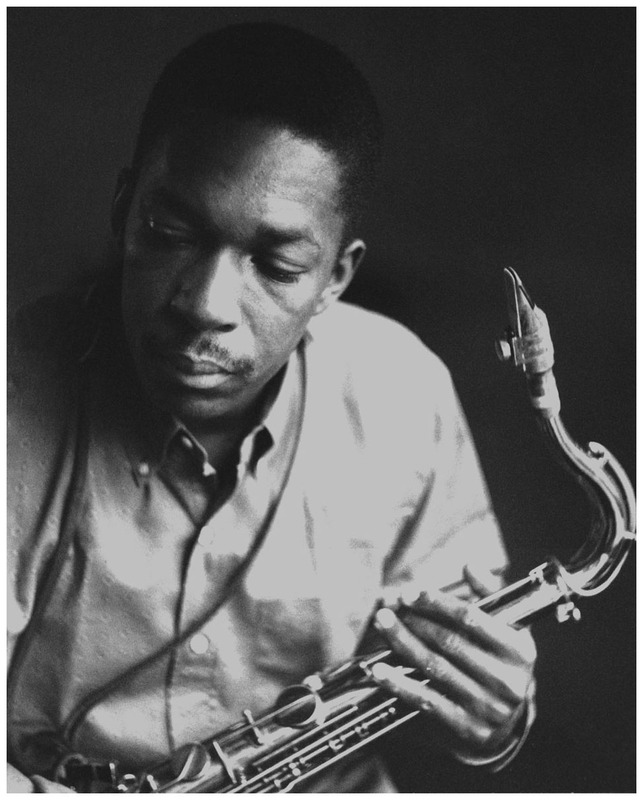 In “My Favorite Things,” the rhythm section of Elvin Jones on drums, Steve Davis on bass, and McCoy Tyner on piano provide a multileveled musical context against which Coltrane’s transformation of the melody, harmony, and rhythm of the tune interacts. 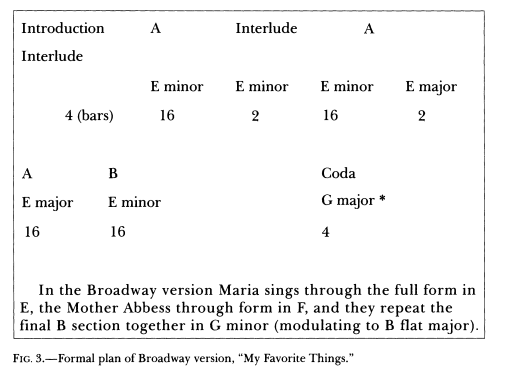 Figures 1 and 2 help illustrate the nature of these transformations by presenting transcriptions of the melody and rhythmic framework of the ensemble accompaniments in the original Broadway cast recording of “My Favorite Things” and the John Coltrane version, respectively. The Broadway arrangement supports the sung melody with an accompaniment that alternates pizzicato rhythmic figures with sustained harmonies in the strings (mm. 5-20). The rhythmic figure in the interlude is the “um pah pah” figure typically associated with the waltz (mm. 21-22). This rhythm provides the main accompaniment for the second and third A sections of the tune (see fig. 3). Musical contrast in this arrangement is generated through alternation of short and sustained instrumental sonorities, through changes in dynamics (compare measures 21 and 39), and by changes in mode (from minor to major in the third A section). The arrangement supports the clear articulation of the text with an unsyncopated rhythmic framework. The animating concept in the Coltrane version is very different. The accompaniment (what musicians call “the groove” or rhythmic “feel”) consists of three independent yet interlocking parts played by the drums, piano, and bass. Figure 2 presents a rhythmic transcription of the Coltrane version. I have limited my transcription of the drum part to the principal time-keeping rhythm articulated by Jones on the ride cymbal and occasional interjections on the snare and bass drum. The first vamp section begins in measure 9. Note that Jones, Tyner, and Davis all play different but interlocking two-bar rhythmic patterns. The timbre and accentuation of Jones’s ride cymbal rhythm makes it particularly infectious-something not visible on the transcription itself. The repetition at two-measure intervals gives the vamp sections a strong six metric feel. (See figure 4 for the form of the performance.) By contrast, in the A sections of the melody the rhythm section plays rhythms that repeat at one measure intervals, giving these sections a rhythmic feel in three. Tyner’s rhythmic riff figure, which begins in the vamp section at measure 33, becomes the “home” comping rhythm, and the interlocking quality of his part with the drums and bass tonic pedal point produces the “hypnotic” feel often mentioned in contemporary accounts. Against this syncopated and interlocking rhythmic and harmonic groove it would be almost impossible to play the melody as squarely as it is written in the sheet music. Coltrane articulates a highly syncopated version of the melody against the rhythmically interactive musical context, providing a fourth independent part to the texture (mm. 17-33). Upon first listening, the dramatically different groove stands out. It sets the basic tone for the entire piece. Michael Carvin claims that a good rhythmic feel has a foundational quality: “the groove is the point of departure for ALL improvisational music.” It is also one of the most important means for infusing African-American improvisational sensibility into music from other repertories. This transformation of “My Favorite Things,” or what Gates would term “Signification” upon the tune, inverts the song at nearly every level. It makes the vamps (over which the improvisation takes place) rather than the verse the subject of the performance; it transforms waltz time into a polyrhythmically textured 6 feel, and it transforms a sentimental, optimistic lyric into a vehicle for a more brooding improvisational exploration. Since the lyrics would have been on the sheet music the song plugger brought to the quartet, Coltrane would have been well aware of the emphasis on “white” things in the lyric-girls in white dresses, snowflakes on eyelashes, silver white winters, cream-colored ponies. In 1960—a year of tremendous escalation in the civil rights movement and a time of growing politicization in the jazz community—Coltrane quite possibly looked upon the lyrics with an ironic eye. Another possible inversion involves Coltrane beating European-American musical standards at their own game; this is where the idea of irony at a cultural level becomes important. Coltrane’s version of “My Favorite Things” turns a musical theater tune upside down by playing with it, transforming it, and turning it into a vehicle for expressing an African-American-based sensibility in such a way that even many non-African-Americans prefer it to the original. In so doing, it invokes some standards of European classical music against European-American musical theater songs. 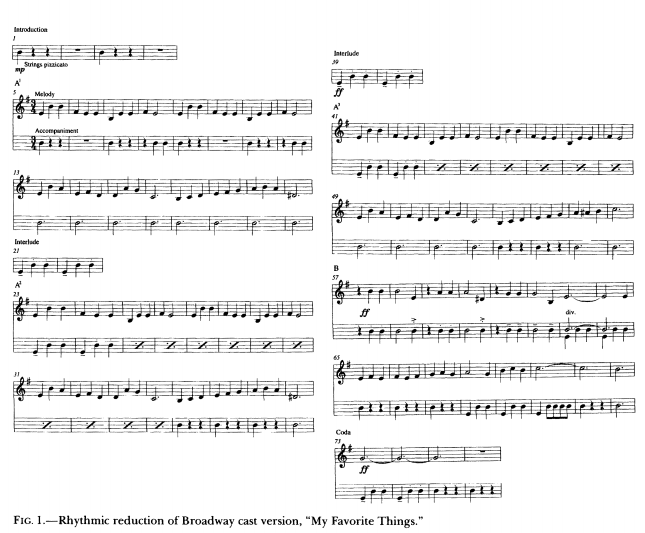 The simple setting of the Broadway version of “My Favorite Things” works well in the context for which it is intended, that is, a musical theater performance. In addition, the performance is “well played” by musical theater standards; the strings and singers are in tune, observe dynamics, and keep a steady tempo. 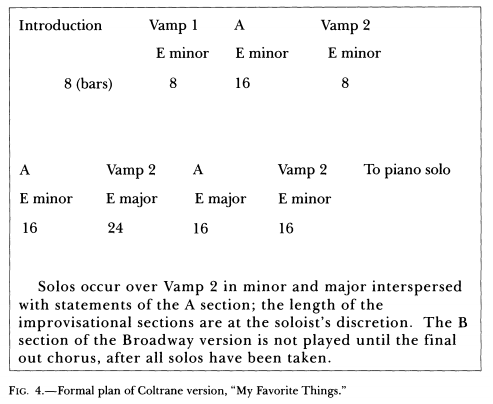 By the evaluative standards of “Western art music,” however, the tune and arrangement perhaps would be described as “pedestrian,” “unsophisticated,” “simple,” or “too obvious.” In this context, the Coltrane version of “My Favorite Things” embodies selective elements of Western art music aesthetics more effectively than does the Broadway version. The four-part contrapuntal texture generated by the musicians in the Coltrane Quartet is certainly “more complex” when measured by Western art music standards than the rhythmically simpler framework of the Broadway version of the tune (compare fig. 1, mm. 5-13, and fig. 2, mm. 17-25). Jazz musicians, in this sense, are able to invoke selectively some of the hegemonic standards of Western art music in their favor. At least part of the pride many African-American jazz musicians take in their versions of standards derives from their ability to “upstage” the European-American versions of these tunes-something acknowledged by both black and white audiences. In asserting a musical “superiority” even when measured against the (white) hegemonic standard, musicians make ironic the presumption of racial inferiority. Not only does the Coltrane version stand out in comparison to the Broadway version with respect to some standards derived from the European-American world, it does so while at the same time articulating an independent improvisational aesthetic that draws on African-American cultural sensibilities and that is the taken-for-granted standard against which non-African-American music is evaluated. Jean and John Comaroff’s conception of ideology is helpful in thinking about this issue and in considering the role of assertion and cultural critique in the practice of jazz improvisation. Ideology in the Comaroffs’ conception draws upon Raymond Williams’s definition: “an articulated system of meanings, values, and beliefs of a kind that can be abstracted as [the] ‘worldview’” of a particular group. The emphasis here is upon articulation. If hegemony rules by silence and “taken-for-grantedness,” ideology is spoken and asserted. To borrow a linguistic analogy: hegemony is the unmarked category, ideology the marked. See John Coltrane, My Favorite Things, Atlantic SD-1361, recorded in New York (21,24, 26 Oct. 1960); Richard Rodgers and Oscar Hammerstein II, The Sound of Music (vocal score) (New York, 1960). Gates juxtaposed Julie Andrew’s “vapid” version from The Sound of Music to Coltrane’s as a particularly telling example of reversal. See Gates, “The Blackness of Blackness: A Critique of the Sign and the Signifying Monkey,” in Black Literature and Literary Theory, ed. Gates (New York, 1984), p. 291. Coltrane’s version, however, predates the film, which was released in 1965. Mary Martin sang in the original stage production. The power of mass culture to affect our interpretation of history is apparent here, as most Americans are more familiar with the Julie Andrews version. Mary Martin, The Sound of Music: Selections, Columbia CK-32601, original Broadway cast. All musical transcriptions were done by Ingrid Monson. Musicians’ definitions of the concept of groove are presented in Monson, “Musical Interaction in Modern Jazz,” pp. 316-21. Michael Carvin, interview with author, 12 Dec. 1992. A song plugger (song salesman) supplied the sheet music to the Coltrane quartet while they were performing at Joe Termini’s Jazz Gallery in New York in 1960. See Thomas, Chasin’ the Trane, p. 133, and The New Grove Dictionary of Jazz, ed. Barry Kernfeld, 2 vols. (London, 1988), 2:278. For an account of the general escalation of the civil rights movement in 1960, see Taylor Branch, Parting the Waters: America in the King Years 1954-63 (New York, 1988), pp. 271-311. 1960 was also the year Ornette Coleman became nationally known and the controversy over “Free Jazz” began to develop. See A. B. Spellman, Four Lives in the Bebop Business (1966; New York, 1985), pp. 79-150. In October 1960 Charles Mingus recorded his version of “Fables of Faubus,” with lyrics explicitly protesting Governor Orval Faubus’s refusal to allow nine black students to enroll in Little Rock, Arkansas’s Central High School. Charles Mingus, Charles Mingus Presents Charles Mingus, Candid BR-5012, recorded in New York, 20 Oct. 1960, and Branch, Parting the Waters, pp. 222-25. By “Western art music” I have in mind the aesthetics produced in post-Enlightenment Western Europe and particularly nineteenth-century German concepts of “serious music” and “absolute music,” since these were quite influential in the United States. See Charles Hamm, Music in the New World (New York, 1983), pp. 307-38. Quoted in Comaroff and Comaroff, Of Revelation and Revolution, p. 24.